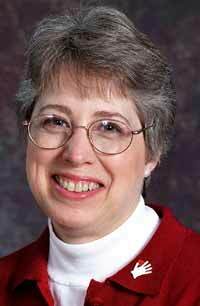 Fourteen years ago, June Nielsen read an article about AIDS babies that so distressed her, she resolved to try to help children in crisis in her own community of Corvallis, Oregon. Physically holding and comforting them was impossible, but she could do the next best thing: offer them the warmth of a lovingly handcrafted quilt. 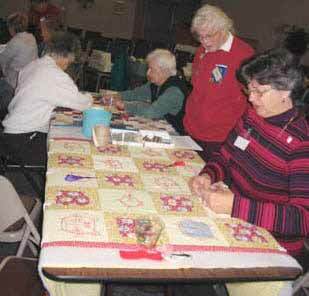 June had been quilting since the early �70s, and she had always been drawn to volunteer work. So, after contacting local social service agencies to inquire about their needs, she asked three friends to help her, and �Quilts from Caring Hands� was born. Fast forward to spring, 2004. 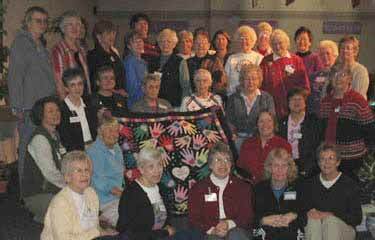 From the original four members, the group has now grown to 45, and donates over 300 quilts a year � to date more than 3,200 in total � to 11 organizations that assist homeless, visually impaired, abused and drug addicted children. 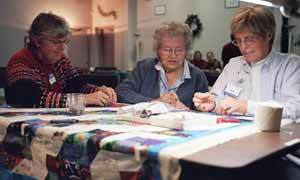 Today it�s Wednesday, and some 35 women are gathered in a room of a Corvallis church, where they meet each week to assemble crib and twin-size quilts. Many are tying quilts; some are working at the cutting table; others sit at sewing machines making bindings. The room vibrates with activity, conversation and laughter. It's always like this, says Larky Hansen, a member of QCH for more than five years and a past chair. The camaraderie derives from the welcoming atmosphere, which extends to new members as well, even those with little or no experience. �Anyone can learn to tie a square knot,� June says, referring to one of the central activities: tying, the process of joining together a quilt�s three layers. �Members help each other build quilting skills,� says Larky, who was a beginner herself when she joined but is now �addicted to quilting and to this unique group of friends.� She credits June for the group�s positive outlook and �generous, loving spirit.� The women treasure the personal support they receive from the friendships they have formed, but also recognize that their underlying common purpose � to offer love and comfort to at-risk children. QCH receives help in the form of grants and donations, and in turn shares patterns, instructions and start-up advice with new groups via the Internet. Many of their materials are donated, but bolts of cloth are also purchased wholesale or on sale. They�re always on the lookout for special fabrics for visually impaired children: �Terry cloth, velvet, corduroy, satin � anything with texture, to encourage curiosity,� June says, adding that for children with a little sight, vibrant colours and strongly contrasting patterns serve the same purpose. Is there someone you would like to submit a nomination for the annual award from Harlequin? To learn more about Quilts from Caring Hands and the Harlequin More Than Words program, visit www.HarlequinMoreThanWords.com.